The full-page colour advertisement depicting a giant locust overlooking Hong Kong's skyline is a striking representation of the recent surge in anti-China feeling here. 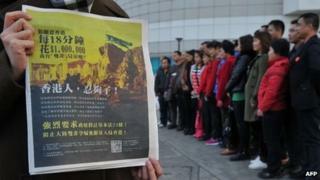 A group of Hong Kong residents raised money online to fund the advert, which was published in the popular Apple Daily newspaper. It depicted mainland visitors as locusts, amid growing tension over an influx of visitors. Fifteen years after Hong Kong rejoined China, the gulf separating citizens in the former British colony and those on the mainland appears to be widening. The two groups share a common written language and culture. But differences in the spoken dialect, politics, economic standing and even personal hygiene have ignited a series of very public disagreements. These have ranged from who gets preferential treatment at luxury shops to how to behave on the subway and who has the right to give birth in Hong Kong. Xu Xi, a widely published author and writer-in-residence at the City University in Hong Kong, said recent confrontations were the result of long-simmering tensions. "Hong Kong people welcomed the handover with open arms. But over time, we realised that we simply moved from one colonial master to another," she said. "There is a great deal of misunderstanding on both sides. On a daily basis, I see it and I hear it." Hong Kong was a Crown colony for 150 years until 1997, when it was returned to China. The city is governed under the "one country, two systems" policy. It is largely free to run its own internal affairs, whilst Beijing sets foreign and defence policy. Since the handover, the number of mainland visitors to Hong Kong has surged. Last year, the city hosted 28 million tourists from mainland China. That is four times the entire population of Hong Kong. Many come primarily to shop. Unlike the mainland, Hong Kong has no sales tax, so it is usually much cheaper to buy here, particularly when it comes to designer clothing, status handbags and high-end electronics. In areas such as Tsim Sha Tsui, where Western luxury brands such as Louis Vuitton and Dolce & Gabbana have set up shop, the predominate dialect heard on the street is Mandarin, rather than the local Cantonese. The Dolce & Gabbana store was the site of protests in January after word spread online that security guards there allowed only mainland tourists to take photos. The protests, which eventually shut the store and forced Dolce & Gabbana to apologise, highlighted feelings among Hong Kong residents that wealthy mainlanders were getting special treatment. Gordon Mathews, an anthropologist at the Chinese University of Hong Kong, says envy definitely plays a role. "Thirty years ago, mainland people were 'achan' - they were thought to be country bumpkins. And now the richest people in Hong Kong are tourists from the mainland, or investors from the mainland," he said. "That's rather shocking and upsetting to many people in Hong Kong, and I think that is an underlying reason for these kinds of protests that we see." On average, Hong Kong people are still much wealthier than their mainland cousins. But the conspicuous consumption displayed by the sheer number of Chinese millionaires and billionaires shopping in Hong Kong has been upsetting locals for years. There is also a feeling that, even as mainlanders get wealthier, their manners and etiquette leave room for improvement. In January, a mobile phone video of a shouting match between mainlanders and locals on the Hong Kong subway went viral on the internet. A young mainland girl visiting Hong Kong with her mother was caught eating dried noodles on the subway, where eating is not allowed. Security was called and a very public row ensued. Mainlanders accused locals of bullying, while Hong Kong residents insisted the visitors were rude and paid no heed to hygiene in a densely populated city. Anthropologist Gordon Mathews says that as a white American he would have been forgiven for not knowing the rules. Hong Kong bloggers say the real issue is that the passenger who politely asked the young girl to stop eating was ridiculed for speaking poor Mandarin. After the video was widely shared, a professor at Peking University called some Hong Kong people "British running dogs" for looking down on mainlanders, triggering a protest by about 100 residents at the Beijing liaison office. Wang Yiting, a mainland student attending university in Hong Kong, says she understood the reasons behind the protest. "It makes me feel very uncomfortable, but I can understand why Hong Kong people are so angry with us," she said. Hong Kong residents are also incensed about a surge in birth tourism, which they say is straining the medical system and putting lives at risk. In the past 10 years the number of mainland women crossing the border to give birth has soared. Almost half of all babies born in Hong Kong in 2010 were the children of mainland couples, according to government figures. Ethnic Chinese babies born in Hong Kong automatically receive the right to live and work here, as well as the right to carry a Hong Kong passport, which makes international travel easier. Some mainlanders also choose to give birth in Hong Kong to skirt the one-child policy, which can result in heavy fines for violators. The Hong Kong government has already imposed quotas on the number of mainland mothers allowed to give birth in local hospitals, but residents say the quotas do not go far enough. Bruce Lee, a 21-year-old university student, has roots in eastern China. Still he considers himself a Hong Kong person first and foremost, and was one of the many donors who funded the "locust" advert. "Some of these people come to Hong Kong in order to enjoy the benefits that this city offers without giving anything back," he said in between classes at the Hong Kong Baptist University. "They are basically stealing from us, taking advantage of what locals have created through hard work." Both Hong Kong and mainland officials are promising to crack down on birth tourism. The head of Guangdong province's family planning department has told reporters that anyone caught going to Hong Kong to evade the one-child policy will be punished. One lawmaker, Albert Chan of the People Power coalition, is even planning to introduce a new bill in the Legislative Council making it almost impossible for mainland women to give birth in Hong Kong. "The situation is in such a terrible state," he said. "Sooner or later, because there isn't enough medical staff to deal with so many women giving birth, local women may find their lives in danger." The Hong Kong government is facing calls by other politicians to re-evaluate its immigration policy. It is a sign that after 15 years, despite all the financial support Beijing offers Hong Kong, the city is not completely embracing a return to the motherland.